The American duo Hungry Lucy take you on a dark trip-hop journey hovering between melodic low-tempo electronics and ghostly emotional female vocals. The mysterious depth and subtle innocence of Christa Belle's sombre lyrics give a certain gothic twist to the modern electronic compositions. If comparisons have been made with Portishead, Switchblade Symphony, Bel Canto, Dead Can Dance, etc. the strong identity of Hungry Lucy makes them stand out as different and unique. The trip-hop rhythm arrangements are surrounded with lush melodic avantgardish orchestrations, creative electronic loops and shimmering atmospheres, while the catchy vocals delicately merge with the music. 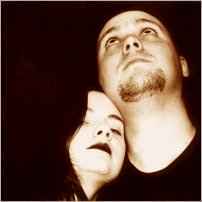 Their debut album "Apparitions: revisited", is a splendiferous symbiosis of emotions that can't leave you unaffected and can appeal to a rather wide audience (from the modern goth wave listener to the trip-hop goer through any romantic synth pop lover). Their second album entitled "Glo" continues the American duo's tradition of mellow gothic grooves, catchy melodies and Christa Belle's enchanting vocals. This album branches out a little further though, into trip-hop electronica.